Surgeon and writer Sherwin Nuland (2010) published a collection of first-person narratives of various medical specialists entitled The Soul of Medicine. Nuland does not explain the title, but the stories illustrate his point. Physicians cannot merely be technicians. They play a diversity of roles: pastor, counselor, advocate, guide but also friend and confidant. Only at the closing page of the book, Nuland concludes that while diagnosis has been much improved, and is faster and more accurate today than ever before, something has been lost. More data, information and perhaps knowledge will enable to categorize patients but what is more important is clinical judgment: what is best for this individual patient? Another medical writer, internist Jeremy Groopman (2007), points out how medicine desperately tries to combine an objective, disease-centered and a subjective patient-centered dimension. Healing requires a mixture of science and soul. Other authors are more explicit. They argue that modern medicine has lost it soul. It has become ‘sick care,’ and does not create health (Botha 2017). It does no longer provide holistic care, focused on the whole person. It is guided by a materialistic and mechanistic ideology that reduces the patient to a complex body machinery. Many patients are therefore dissatisfied and appeal to alternative approaches for a broader vision of health (Accad 2016). The focus of medicine is primarily on treatment and cure, neglecting the wider context of the life story in which illness has emerged (Kuczewski 2007). Furthermore, the context of health care itself bolsters this trend: economic pressures, lack of time for interpersonal communication, fragmentation of care lead to dehumanizing experiences for patients. For example, increasing attention for prevention without a population perspective will only reinforce the individualistic orientation of healthcare, over-emphasizing personal responsibility for health and individual choice, thus violating the soul of public health (Wiley 2016). However, losing the soul of medicine has also serious implications for healthcare providers. More attention is currently given to their vulnerability and limitations. Physician burnout and suicide are higher than in the general population. Among medical students, anxiety and depression are prevalent (Botha 2017). Many clinicians are clinically depressed and consider dropping out of the profession (Remen 2001). The ideal of compassionate and empathic care with which they started medical school has not been achieved in daily practice. On the contrary, medical training has made them cynical, nihilistic, and numb (Neumann et al. 2011). It has encouraged professional distance and detachment. Like their patients, health care providers feel depersonalized. Current medicine offers no room for physicians as persons; in the words of some commentators, they have been reduced to automatons (Khan and Sodhi 2016). Practicing medicine requires intellectual development, training of competencies and skills but it is not considered a work of the heart and the soul. Ethics education is frequently advocated as an adequate antidote to these trends. It should produce attentive and caring physicians by nurturing their soul (McBride 2013; Perakis 2013). 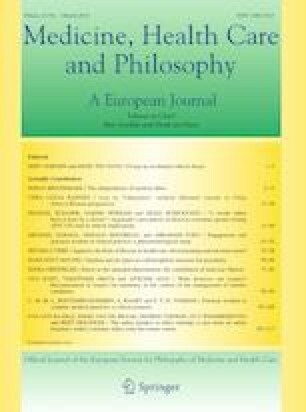 Given the enormous efforts made over the past decades in expanding and intensifying ethics education, it is problematic whether it can help to achieve the dream of making medicine more humanistic and holistic, especially when it is argued that bioethics itself has lost its soul (Meilaender 2009). How can the soul of medicine then be recovered? Kuczewski (2007) emphasizes the role of medical humanities. They show the human aspects of care and the subjective experiences of patients as well as the importance of social interaction. What is highlighted is the role of moral imagination. Moral imagination is not merely an inventive power that gives us different ways of seeing the world. First of all, it provides the capability to empathize with others. It helps us to experience the situation of other human beings, to recognize situations like ours and to notice the moral demands that others make upon us. Second, moral imagination identifies various possibilities for acting. It encourages us to envision how action might help or hurt, to anticipate possible consequences of actions, and to project possibilities into the future (Wright 2003). Moral imagination is connected to reflection. In order to counter moral erosion during medical education, mechanisms for reflection should be developed. Kuczewski argues that this is important for two reasons. Reflecting upon experiences will increase control of life-long development of students. It will furthermore help to overcome the isolating effects of medical practice for practitioners (Kuczewski 2007). Sharing thoughts and emotions will not only assist health care providers to articulate their own subjective experiences but also make them more attentive to patients’ experiences. The issue at hand includes two contributions that address the question of how ethics education can be improved. Schei et al. make the case that reflection is the best way to overcome the shortcomings of medical education (Schei et al. 2019). Assuming that the main purpose of education is not transfer of knowledge but transformation and learning how to live, they explain their experiences with reflective practices in medical education at the University of Bergen in Norway. The most important lessons seem to be that first-year medical students are required to visit patients at home, communicate with them and understand how illness influences the patient’s life. Being confronted with the subjective life-world of patients is a first step to reflect on what is the fundamental fact of medical care. Another road to reinsert the soul in medical practice is taken by Nahardani et al. (2018). Personal beliefs, life experiences, and holistic health are articulated in the concept of spirituality. Over the past 10 years, spirituality has been the subject of substantial research output (675 publications in 2018 according to PubMed). But, as the authors argue, the concept is broad and not well defined. It was perhaps first introduced in the context of palliative care (Hermsen and Ten Have 2004), illustrating the idea that the hospice movement is bringing back the soul into medicine (Kearney 1990). Nahardani et al. (2019) argue that spirituality is important for all dimensions of health care. It has a specific role to play in medical education and is more and more included in medical curricula. Education may be regarded as an enterprise that is specifically targeting the human soul (Danielson 2007). In their conceptual analysis, Nahardani et al. show that the first defining attribute of spirituality is: teaching with all heart and soul.